Saag or Palak is a well-loved Punjabi cuisine that originates from the northwest region of India. A lovely, earthy dish with a mild and subtle flavour, the luscious Saag is a classic and is considered one of the great curries of India. It has a most richly flavoured complex flavor profile. ‘Saag’ typically refers to green leafy vegetables in Hindi, such as mustard, collard greens or swiss chard. Palak means spinach in Hindi. 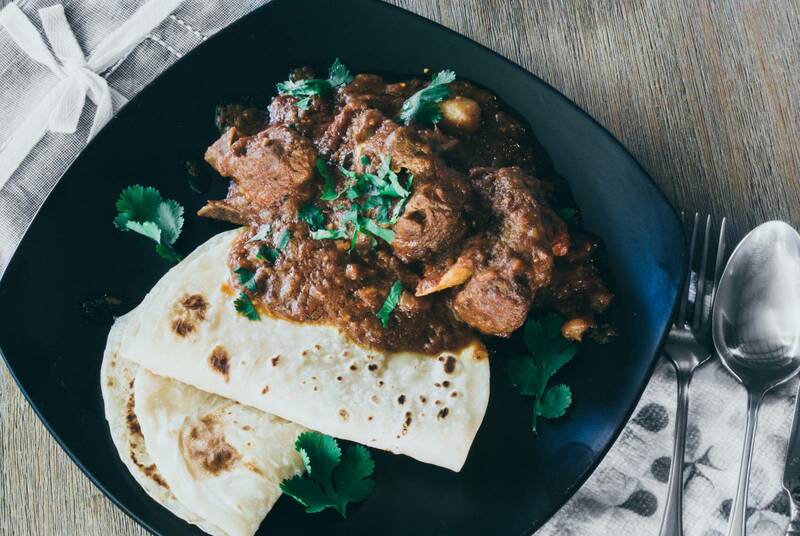 More often than not this dish is prepared as Saag Paneer or Palak Paneer for vegetarians and Saag Gosht for meat eaters.’Gosht’ tends to mean goat meat, however lamb, mutton, chicken and beef works equally well. Although many in India do not eat beef, this Beef Saag recipe is an adaptation of the Saag Gosht. Cooked in a fragrant green smoothie sauce its just delightful eaten with rotis, naans or pilaf rice and a side of cool crunchy salad. Full of flavour, as the savoury beef pairs perfectly with the cooked creamed greens. Using coconut cream is my version as the madras paste contain coconut as well. You can get excellent flavours using the same amount of fresh cream instead – refer to Options after the recipe. Heat oil in a large deep 5 litre saucepan, add fennel seeds and when golden add minced onion, spring onions and radish or turnip. Cook on fairly high heat to a thick paste until all water has evaporated, around 12-15 minutes. Next add Latasha’s Kitchen Madras Curry Paste, a jar of water and all the juice from the tin of tomatoes. Cook over medium heat, stirring continually for around 10 minutes or more to release the flavours and to allow a thickish fragrant paste to form. Now turn the heat to high, add the diced meat all together, and mix well to coat the paste, stirring constantly. Cook over high heat for about 8 minutes until the meat has browned and is no longer pink. Now add in the pureed green chillies. Mix well. Then add the rest of the tomatoes, coconut cream and water − stir to mix well, then bring to a simmering boil. Add the potatoes over the top. Now cover with a lid and cook on low for 1.5 hours until nearly done and most of the liquid has evaporated. In a blender add in the chopped frozen spinach or kale, along with the fresh cream, milk and grated nutmeg. Add this pureed spinach into the saag curry, mix well, pop the lid back on and continue to simmer for another 10 minutes. Add ghee over the top of curry and adjust salt as required. Omit 200 ml coconut cream from Step 6 and instead replace with same amount of water. But increase the amount of cream and milk used at Step 8 to 300 ml of fresh cream, 1/2 cup milk and 1/8 tsp grated nutmeg when pureeing the spinach. Another option if you do use Coconut Cream as suggested at Step 6 and instead wish to opt out of fresh cream and milk at Step 8 is to just puree the spinach with 1/8 tsp grated nutmeg and 1/2 cup boiled warm water at Step 8. This version of Saag Curry will be more like a rustic green smoothie curry, and less creamy. For this version fresh cream can always be served on the table for those who wish for a creamier velvety finish. Instead of potatoes, use kohlrabi or Jerusalem artichokes. Do not omit the green chilies as it makes all the difference. The brand of tinned tomatoes and coconut cream can make all the difference to this dish. This recipe works really well with Latasha’s Kitchen Coriander Curry Paste for a milder option and Latasha’s Kitchen Homestyle Curry Paste for a much hotter flavour.